Sergeant Eugeniusz Nowakiewicz – a participant of The Battle of Britain, after shooting down another Me-109 above the English Channel. He shares his first impressions of the flight with the unit’s commander Captain J. Kowalski. 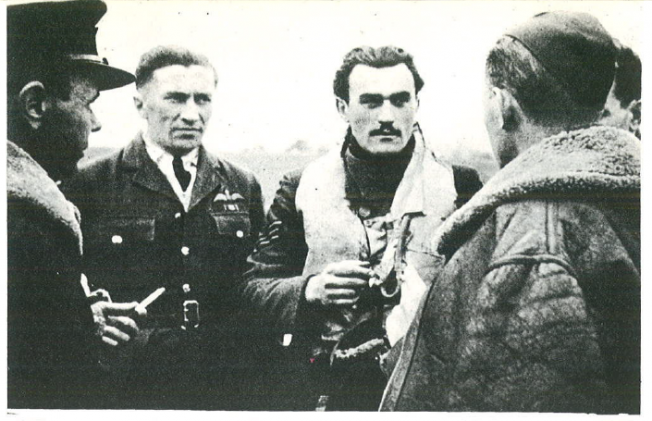 On the right we can see Lieutenant R.Narucki’s ear, on the left there is Sergeant Domagała and adjutant of Squadron 302, Captain Łukaszewicz. RAF Kenley, 8.V.1941. 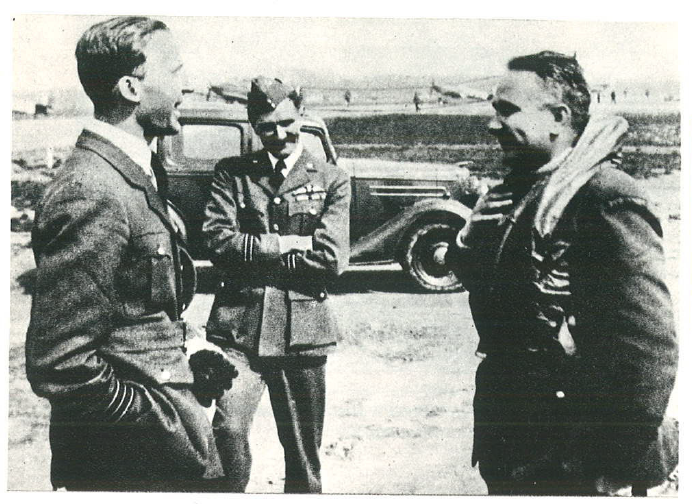 Commandant of RAF Kenley Sqr/Ldr (Major) John Peel during discussion with the commander of Squadron 302, in readiness, Major Piotr Łaguna. The visit of officer Stefan Pawlikowski at 302 Squadron at RAF Kenley. 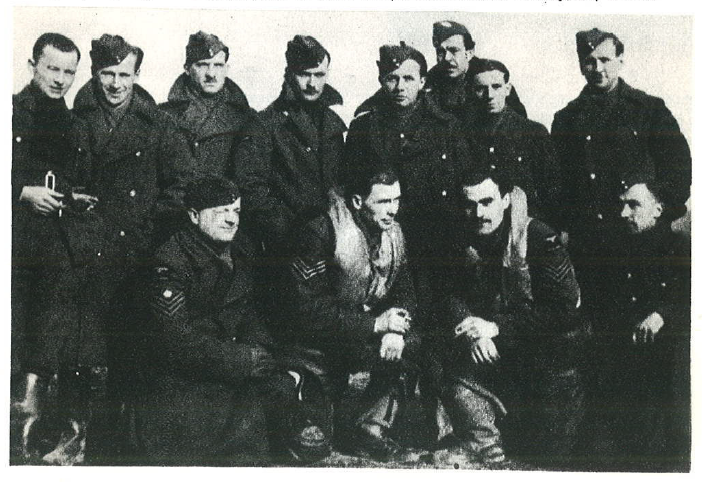 From the right: commander of 302 Squadron Major Piotr Łaguna, Lieutenant Jan Wydrowski, Sergeant Jan Załuski, Officer Stefan Pawlikowski, Sergeant Eugeniusz Nowakiewicz, Sergeant Bronisław Malinowski, Sergeant Antoni Łysek, squadron’s paramedic Sergeant and Adjutant Captain Łukaszewicz. Very rare and valued guest from Poland, a fellow pilot, who arrived with detour to his colleagues of Squadron 302. From the right: officers Włodzimierz Karwowski and Stanisław Łapka, Captain Tadeusz Czerwiński, Reserve Officer Engineer Bronisław Bernaś, Officer Jan Maliński, guest from Poland and Captain Łukaszewicz. Officers' mess at RAF Kenley, April 1941. Officers' mess at RAF Kenley, Easter 1941. 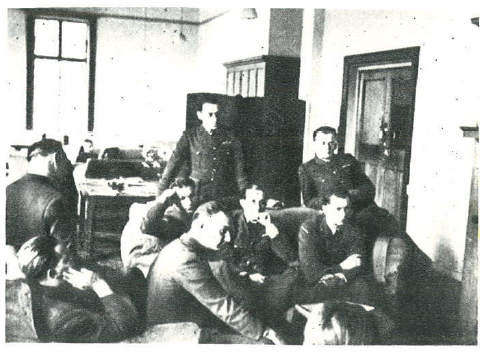 Pilots of Squadron 302 focused listen to the Commander Major Piotr Łaguna. 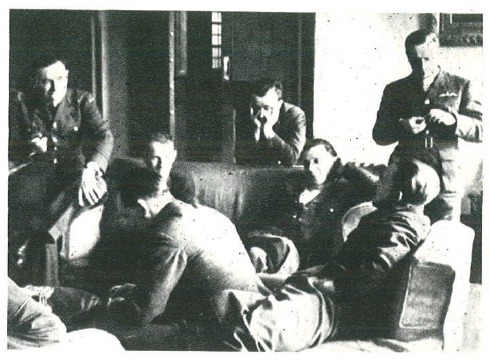 From the right: Officers Stanisław Chałupa, Marceli Neyder, Zbigniew Wróblewski, from side Jan Maliński, deep inside Władysław Gnyś, Ryszard Narucki, in armchair Stanisław Łapka, from side, always avoiding photos, doctor of the Squadron, Dr. Stanisław Pokrzywnicki. Despite such protected location, Squadron 302 lost several Hurricanes as a result of bombing. On the left wing a parachute prepared for the pilot. Engine battery on a trolley attached to the engine. A fire extinguisher by the wall. Three maintenance technicians and sergeant Joseph Gumowski supervising everything. Further away an emergency alarm speaker. RAF Kenley. Pilots of Squadron 302, Sergeants A. Łysek and M. Nowakiewicz and maintenance staff of Hurricanes; mechanics, gunsmiths, radio technician. 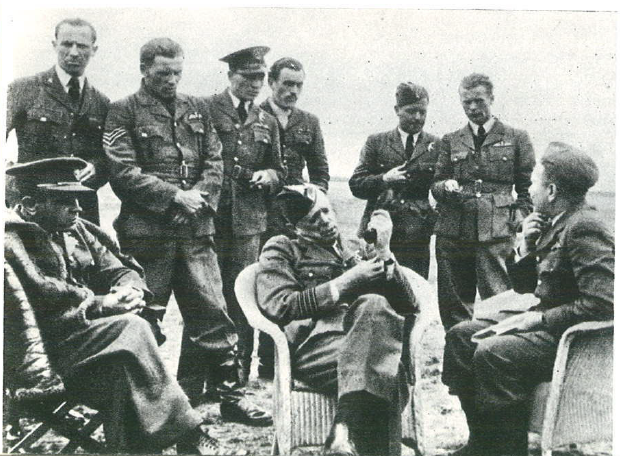 Kneeling on the left Senior Sergeant Bolesław Psujek, second on the right (standing) telephonist and signaller of the squadron, an Englishman. He gave the signal to start with the rocket. RAF Kenley, May 1941. 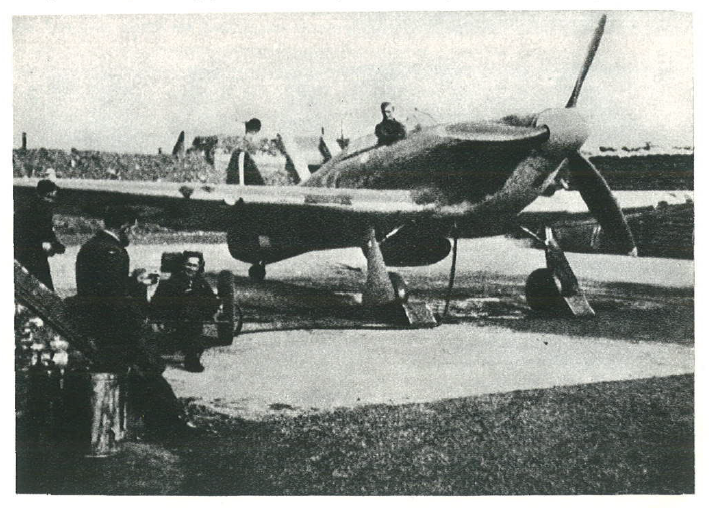 The photos above come from Jan Jokiel’s book “Participation of Poles in the Battle of Britain: a photo album with commentaries of the participants” (original title: “Udział Polaków w bitwie o Anglię: album fotografii uczestników z komentarzem”, Warszawa 1972). The author wrote there: “I share with the readers a part of the photos that were made during the Battle of Britain or directly after it, and those that I was able to gather. I hope they will forgive me their technical and artistic level, but will appreciate their uniqueness”. Jan Jokiel was born in Lodz, Poland on 28 July 1906. After the outbreak of the World War II he fled the country to join the army. 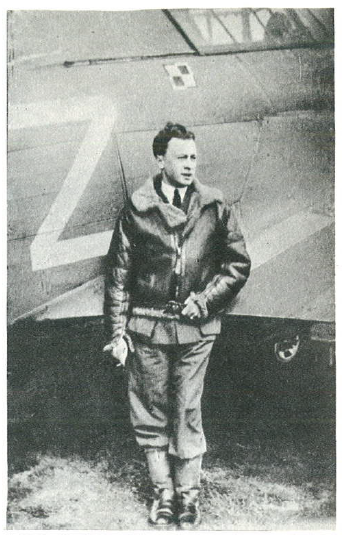 As an air force Major (V. M.) and intelligence officer he served in the Squadron 302 which stationed at various English airfields, including Kenley. He was also interested in photography and owned a good camera which he used to capture the everyday life of his colleagues. In 1942-44 he returned to Poland to work as an intelligence agent. After the war he settled in Sopot and became a specialist in the fishing industry. He died on 10 June 1996.